Dambara always used to sing this song at our Christmas concerts, as a beautiful solo with piano accompaniment. Since he moved away, I guess we haven’t quite been ready to have anyone else try it. But it’s always been a favorite of mine, and I recently had the idea to arrange it for a group of singers, just so we could feel like we’re doing something different and not just trying to follow Dambara’s act. 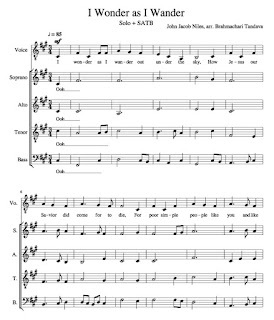 I’m imagining this not so much for full choir as for, say, an octet accompanying a male soloist (though the soprano and bass parts get turns joining on the melody as well). I haven’t ever done a proper choral arrangement before (and it’s not quite the same as all the music theory exercises I did in college, now that I have more of a stake in how it actually works out). But I had a lot of fun over the past week putting this together. If anyone wants to take a look and share thoughts on it, I’m open to feedback. You can download a PDF of the score here. I’d love to hear it sung by actual voices, but we haven’t gotten that far yet. (If anyone out there wants to get folks together and try it, please send me a recording!) In the meantime, there’s this computer-generated mp3, which isn’t great, but is something at least.